The education achievement gap in Minnesota is a real and persistent problem. For example, the 2016 graduation rate among black students was 22 percent below that of white students, while the rate among American Indian students was 35.5 percent below. While the gap in graduation rates has narrowed in recent years, it is still large and troubling. In response, conservatives wring their hands, bemoaning the lack of progress in closing the gap, despite “all the money” that the state has spent on education. In fact, real per pupil state investment in E-12 education has declined over the last fifteen years, especially in the two central city school districts that have a disproportionate share of the state’s minority students. The Minneapolis and Saint Paul school districts have 8.4 percent of total statewide enrollment, but over twenty percent of minority enrollment. In addition, they have a disproportionate share of the state’s English learner, free and reduced lunch (a proxy for poverty), and homeless students. Just as the two central city school districts have a disproportionate share of the state’s minority enrollment, they also have endured a disproportionate share of cuts in state operating aid over the last fifteen years. Fiscal year (FY) 2003 was a milestone year for Minnesota school finance; in that year, the state provided a massive increase in operating aid to school districts, allowing for a massive reduction in school property taxes. Over time, however, the state was unable to maintain its commitment to school funding at the FY 2003; confronted with recurring budget deficits and an unwillingness to increase general revenue, real state spending in a number of areas—including education—was cut significantly over the subsequent decade. In recent years, the state has restored a significant portion of the cuts in state operating aid to school districts. Even after these increases, however, real state aid to public schools is considerably less than it was fifteen years ago. 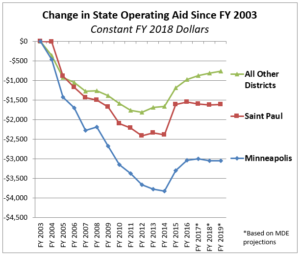 In constant 2018 dollars, state operating aid in the current fiscal year (FY 2018) is projected to be $954 million less than it was in FY 2003; $392 million of this reduction was concentrated in just two school districts: Minneapolis and Saint Paul. * Despite averaging less than ten percent of statewide enrollment over this period, these two districts absorbed over forty percent of the statewide operating aid reduction. The reduction in state support to the Minneapolis and Saint Paul districts becomes even more apparent when we examine the decline in real per pupil dollars. Using Minnesota Department of Education (MDE) data, a recent North Star report demonstrated that nearly all districts underwent a significant decline in real per pupil state operating aid since FY 2003. The per pupil aid losses, however, were particularly severe in the two central city school districts. Real per pupil aid reductions from FY 2003 to FY 2013 in Minneapolis and Saint Paul were considerably larger than in most other school districts. Since FY 2013, real per pupil aid amounts have recovered somewhat, although the increases in the two central city school districts have been somewhat smaller than in other districts. As a result, the projected real per pupil aid reduction from FY 2003 to FY 2019 in Saint Paul ($1,610) is over double the average per pupil reduction in other school districts ($770), while the reduction in the Minneapolis district ($3,049) is nearly four times greater. Since FY 2003, most Minnesota school districts have been able to recoup large cuts in real per pupil state operating aid by increasing local property taxes. This, however, has not been the case in the Minneapolis and Saint Paul districts. Despite real per pupil property tax increases that were significantly larger than the statewide average, the central city school districts have nonetheless experienced a significant reduction in total real per pupil operating revenue. This is particularly true in Minneapolis, where revenues in FY 2019 are projected to be $1,400 per pupil (8.6 percent) less than they were in FY 2003, even after factoring in property tax increases. Minnesotans should be concerned about the achievement gap, but it is hypocritical to express angst over the gap while at the same time targeting the largest cuts in state aid to the districts with the highest concentrations of minority and special needs students. A first step in closing the achievement gap is to reverse a larger share of the state funding cuts that have been disproportionately targeted to the central city school districts. *Amounts cited in the article are adjusted for inflation using the Implicit Price Deflator for State and Local Government Purchases; as noted in a 2016 North Star article, this is the appropriate index to use when adjusting state and local government revenues and expenditures for the effects of inflation. The specific index values used were derived from Minnesota Department of Education (MDE) spreadsheets. All dollar amounts cited in this article are expressed in constant FY 2018 dollars.